In a previous post I discussed the concept of median income and how it avoids certain distortions inherent in mean (average) income. However median income by itself is not adequate to characterize the economic status of households in Howard County (or anywhere else for that matter). In particular, the median income just provides the midpoint for income, i.e., the income value for which 50% of the households make more and 50% make less; it does not address the question of how income is actually distributed among the various households. As it happens, these ten households have exactly the same average income ($118,900, $1,189,000 divided by 10) and exactly the same median income ($101,500, halfway between $43,000 and $160,000) as in the first example. However the distribution of income looks very different; in its division of households between rich and poor it looks much more like Baltimore city or Washington, DC, than it does Howard County. Clearly this difference in income inequality is not captured by the median or mean income, or even by related measures like the difference between the mean and the median. How can we quantify this difference? One commonly-used measure of income inequality is the so-called Gini coefficient or Gini index. 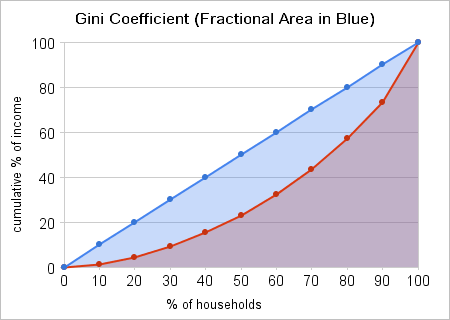 The computation of the Gini coefficient is more complicated than that for mean or median income, but it’s still relatively straightforward and comprehensible. The key is to look at the numbers in the last two columns of the tables above, and especially the last column, cumulative share of household income. The third column simply gives the share of household income going to that particular household. For example, in the first table household #1 has income of $16,000 against a total of $1,189,000 for all households, or 1.35% of all income; similarly household #10 has a 26.66% share of all income ($317,000 divided by $1,189,900), and so on for the other households. The fourth column then uses these figures to compute the share of income going to the poorest n% households. For example, household #1 has a 1.35% share of total income and household #2 has a 3.11% share, so the poorest 20% of households (i.e., households #1 and #2 out of 10 total households) have 4.46% of all income (1.35% plus 3.11%). Similarly we can add the income share figures for households #1 through #9 to determine that the poorest 90% of households have 73.34% of all income, with the remaining 10% of households (i.e., household #10) having 26.66% as noted above. The cumulative share of income can be graphed as shown in the figure below. The red points show the values from the fourth column of the table above, with the red lines then connecting the dots to approximate a curve; if there were more households there would be more points and a correspondingly smoother curve. Again the red points represent the values for cumulative share of income from the fourth column of the second table, with the red lines connecting the dots. What about the blue dots in both graphs? Those represent the ideal case where all the household incomes are equal, or nearly so. In that case the poorest 10% of households will have (almost) 10% of total household income, the poorest 20% will have (almost) 20% of income, and so on. The corresponding curve will then be a straight (or nearly straight) line, here shown in blue. Note that as household income becomes more unequal, the curve of cumulative income share (the red curve) moves further and further away from the blue line representing perfect (or nearly perfect) income equality. 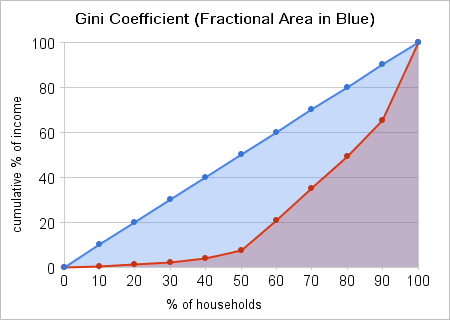 This gives us a straightforward way to define the Gini coefficient: It’s the size of the blue-shaded area between the blue line and the red curve, expressed as a fraction (or percentage) of the total area under the blue line. 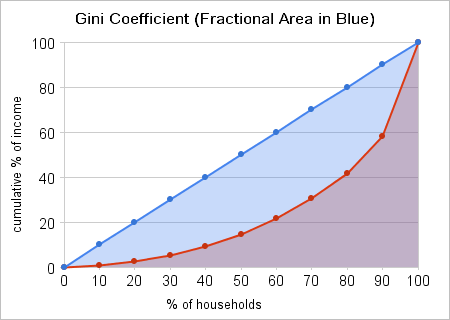 For nearly equal income distributions the red curve will be very close to the blue line, and the Gini coefficient will be close to zero, while for very unequal income distributions the red curve will be far away from the blue line, and the Gini coefficient will approach one (or 100%). In the first example the Gini coefficient is 0.38, nearly the same as the Gini coefficient of 0.379 for Howard County (see the Census ACS table 19083).2 In the second example the Gini coefficient is 0.53. This is comparable to the Gini coefficient for the District of Columbia, which is 0.542. More interestingly for our purposes, it’s nearly the same as 0.534, the Gini coefficient for Fairfield County, Connecticut, a suburban county in the New York City metropolitan area that’s home to many hedge-fund managers and other wealthy financial services professionals. What makes Howard County special with respect to income inequality, and Fairfield County particularly interesting as a comparison? The answers to those questions will be the subject of part 2 of this two-part post.